The imperial coins seller been spamming ...I block bounce of them yesterday and today more you can barely see the level chat some even using world chat...its to early for them to show up. If the devs do NOT combat this issue soon (like before open beta "officially" is out for non-founders), this game will suffer huge player drop offs. 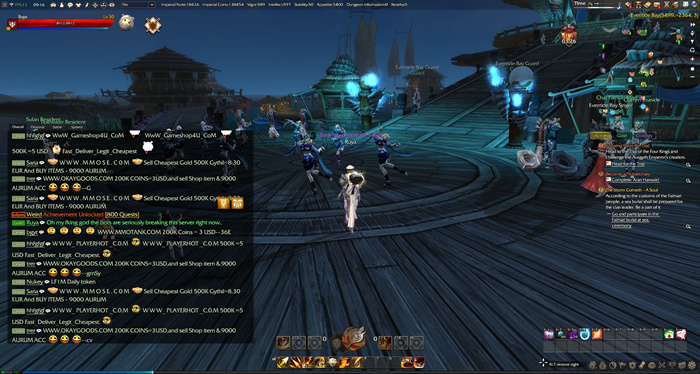 Individual players blocking chat is not an effective means to combating sellers as it would take the entire community as a whole to block in solidarity to clear up chat. That's unreasonable and inefficient to assume everyone blocks spammers. 1. A severe spam block system. If you are spamming the same thing multiple times back to back (seconds apart) you are hit with a 5-10 minute level/school/region/ etc chat ban. 3. In game player moderators! Whether these are employees directly from My.com or players with solid reputations and attitudes that are assigned. They would have the ability to temporarily chat block players. There would be a proper vetting process to assume that non employee "mods" are not around to abuse this power. They would also be required to play a certain amount of hours a week to guarantee they are on doing their job. Any other suggestions? I can't see this game surviving in an already over saturated mmo world if they don't do some severe actions to combat these gold farmers. What Do You Know about the Trading System in Revelation Online?